Earth Notes: ASHP: Domestic Air-Source Heat Pump: Reviews? Know how to make sure that your ASHP installation is greener than mains natural gas for central heating and hot water (CH/DHW) in the UK. In 2008 what's the greenest space/central heat (CH) for a typical UK suburban property along with DHW (domestic hot water)? After insulating to the max... With apologies to Aretha Franklin, is it A S H P? 2011/10/10: Air-Source Heat Pumps permitted development in England from 2011/12/01: The Town and Country Planning (General Permitted Development) (Amendment) (England) Order 2011, see Part 40 Class G.
Assuming that you don't have masses of land for wood or even solar collectors, then mains natural gas at ~0.19kgCO2/kWh of heat is currently probably just about best. It's a lot better than plain old electrical resistance heating (eg immersion water heater and convection/fan space heaters) at a UK grid average of ~0.43kgCO2/kWh. Other fuels such as oil and coal are somewhere in between on cost and CO2. But suppose that you don't want to be burning a fossil fuel for heat. Or you just feel uncomfortable about the energy-insecurity and price of gas. And you don't have space for the collectors of a ground-source heat-pump (GSHP) for example because you live in a flat, what then? In CO2 (ie 'global warming') terms alone, if the heat-pump system has a CoP (Coefficient of Performance, ie how much kWh heat you get out for each kWh of electricity in) consistently at or above ~2.3, then the heat-pump solution beats gas. Why 2.3? Because that's the ratio of the CO2 emissions of electricity/gas per kWh, circa 2008--2016, but the gris is getting greener, implying that a lower CoP will work from a carbon-saving point of view in the future. A GSHP solution can almost certainly manage that CoP of 2.3 or better, year round, especially if used for underfloor radiant (low-temperature) heating. It's a bit harder if DHW is being produced as well, eg over ~45°C. In the long-run the UK's grid electricity is likely to get 'greener' (ie less CO2 per kWh) and natural gas more expensive. So if you have the money and the space for the collectors and the system is installed 'right' in a well-insulated and efficient house, GSHP is almost certainly a good thing. ASHP is likely to have a lower CoP than GSHP, especially in winter when most used/needed, and is thus a dicier proposition right now. Why? Because in winter when you most need the heating (especially space heating) air temperature is likely to be significantly lower than ground temperature, making the system work harder and less efficiently. A typical ground temperature might be ~8°C or higher year round, whereas, although air temperatures are rarely below zero in most of the UK, in winter and at night the air might well be close to freezing. And indeed at air temperatures of about -20°C or lower typical ASHP won't operate at all and you need a backup heat-source such as inefficient electric resistive heating. There is a propect of R744(CO2)-refrigerant-based AHSP for DHW with a CoP of ~4 from an external air temperature of ~0°C, which would certainly be ahead in CO2 terms of even the best condensing gas boiler for DHW, but most ASHP on the market won't get near to that, especially in winter, and you may be needing to replace an entire 'combi' system implying further compromises. Combining with solar thermal may work especially well even in the UK. No space-heating requirement at all for (say) 6 months, and solar meeting almost all DHW demand for the same period. Note that at a CoP of 4 (or higher) then in terms of overall efficiency in terms of heating/DHW kWh from available insolation it may be better to use solar PV (20%+ efficiency) in conjunction with ASHP to provide heating (pulling in extra power as needed from the grid). Why? PV's ability to export all excess in times of low demand (eg summer). That cannot be easily done with solar thermal/DHW systems. For example, in the UK using solar PV and G83/1 grid-tie inverter technology, and assuming a normal single-phase supply, with minimial red-tape up to 16A (3.7kWp) of generation can be connected. Ignoring other electricity demand and limitations for the moment, that corresponds to nearly 16kW of heat availability. That is comparable to a small (gas) boiler. It may of course be possible to get permission from the DNO (Distribution Network Operator, that runs the electricity cables to your house) and the electricity supplier upstream to connect more than 3.7kWp of PV. Then all you need is sufficient roof space. One important point in choosing an ASHP could be its refrigerant. The 'wrong' sort in a domestic system upon leaking/disposal (a few kg but at up to the green-house equivalent of several tonnes of CO2) could easily exceed years of fossil-fuel-fired CO2 flue output. So, from that point of view, good refrigerants with low GHG/CO2(e) impacts include: R744 (CO2 itself), R717 (NH3/ammonia, not a GHG), and R290 (propane). Again, as for GSHP, we could do with good independent reviews in UK conditions. These systems are so expensive that you can't just try two or three, ripping them out until you get it right. And the technology is complex. In private communications with one of the ASHP manufacturers 2008/08, I was told that the UK domestic boiler replacement market is ~1.5 million/year. So everyone is keen to be in it with a good range of productsr. However, CO2/R744 systems were proving very tough to make economically. 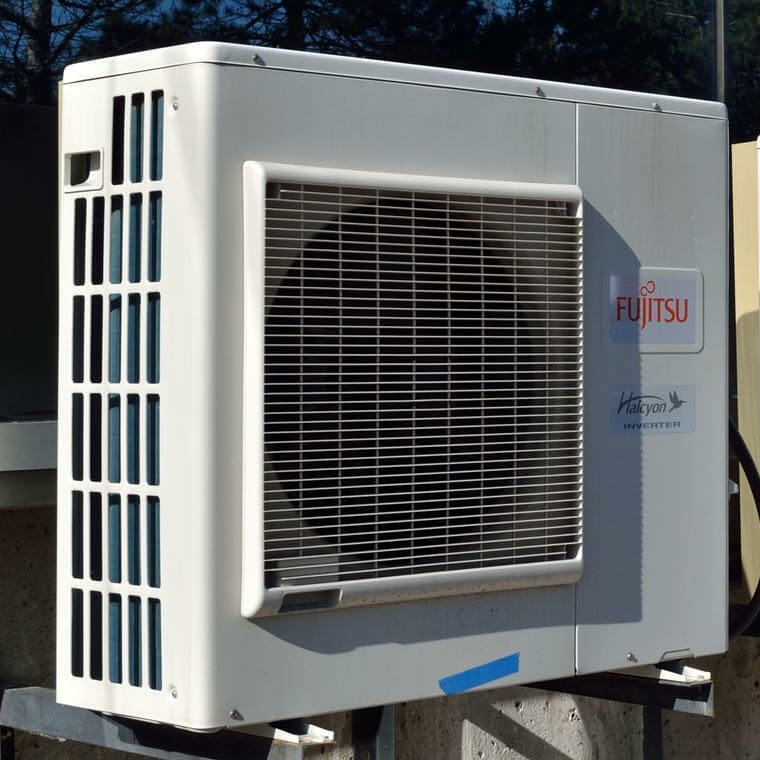 2018/05/08: The PH+ guide to air source heat pumps. 2013/08/13: Stand-by power and air-source heat pumps: known-brand units are using 2kWh/day when doing no heating at all. 2012/01/11: How a Blower Door Works. Southern England: climate Met Office summary of typical conditions to help choose heating-system parameters. Energy Saving Trust 2010 heat-pump field trial, and Lessons From The UK Heat Pump Study: Insulate First And Know What You Are Getting. Carbon Commentary 2010/08/03: What happens to energy bills when a household installs an air source heat pump? Carbon and cash savings were better than I expected, although the ASHP still does not represent a good investment without subsidy. But the government's proposed Renewable Heat Incentive will provide very substantial cash payment to encourage a rapid take-up of these devices. A retrofit of a four-bedroom house in Toddington, built in 2000, saw the house fitted with a non-condensing boiler rated at 23kW, supplying radiators with water at 70°C and with an output of 8.4kW. The hot water demand was 140 litres per day. The boiler was replaced with an ASHP based on a house heat loss of 8kW at an ambient temperature of -3°C. Some radiators were upgraded and were supplied with water at 55°C to provide heating at 8.4kW. The average COPh over the 2007/8 winter was 3.5. The savings, compared to the gas boiler, were 48% less CO2 emissions and a 38% reduction in running costs. Thread on ASHP vs GSHP at the UK Green Building Forum. Thread on ASHP and GSHP at The Oil Drum. 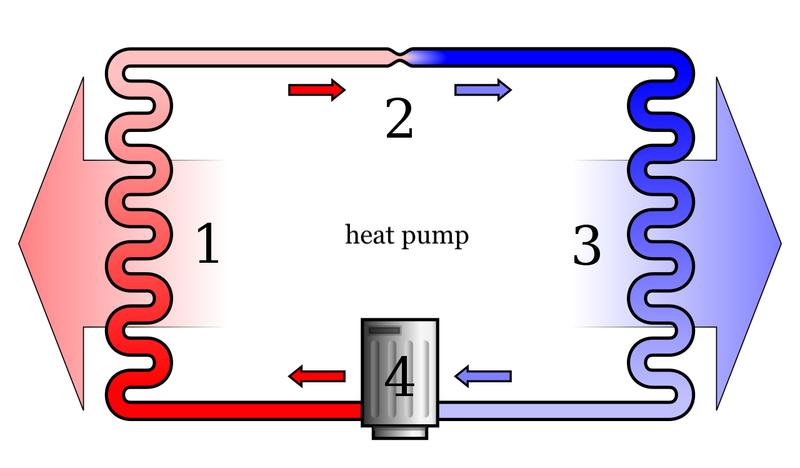 Engineering for a Low Carbon Future: Energy Efficiency Opportunities from Heat Pumps by Alex White of the Cambridge University Engineering Department (2008) suggests that GSHP and ASHP cost about £1/W output (iee £1k/kW) and also that ASHP + rads ("wet CH") offers the best retrofit possibilities. Talk of combined 'instant' ASHP with solar from Hitachi (RHK-23TBA, "EcoCute Instantaneous DHW Heat Pump" up to 23kW heat output from 5kW input) and Matsushita Panasonic in late 2009, which would be very good from my point of view, so that no hot water is stored other than from solar, so no primary energy is wasted. A Transition Edinburgh South note on CO2 ASHP and the Sanyo EcoCute in particular, claiming that at A15W65 the CoP is 3.1 and at A-5W65 the CoP is still 2. Daikin (UK) supplied me with details of its EKSOLHWAV1 solar kit for integrating solar thermal with their ASHP, and see some discussion of ASHP including Daikin + solar, and in this Daikin Altherma thread. Energy Saving Trust (EST) page on air-source heat-pumps. CO2-refrigerant (R744) Eco-Cute DHW heat-pumps to enter EU market with CoP>5. The UK Heat Pump Network. Sanyo Eco-Cute AHSP in Scotland 2010. First published 2008-07-06 , updated 2019-04-21 , rebuilt 2019-04-22 . Site copyright © 2007-2019 Damon Hart-Davis. Hosted by ExNet.